A transportable data centre in a container, module48 is fully self-contained, resilient accommodation for your ICT infrastructure. module48 makes it possible for you to deploy ICT services, practically anywhere, at a lower cost than building and fitting out a traditional data centre. And with fewer overheads, time and design constraints. Being fully self-contained, module48 gives you an integrated, turnkey data centre in the shortest possible time. It’s low-cost, efficient server and network accommodation without the need for a site build. That means immediate availability of ICT services from a data centre which can be redeployed to anywhere you need it. It’s the perfect solution for interim use, but equally suitable as permanent accommodation for your ICT infrastructure. module48–12 (top) and module48–8 exterior and cut-away views. Because it’s transportable and fit for all environments, module48 can be used in harsh remote locations, urban interiors and everywhere in between. On a rooftop, in a basement or out in the open, it’s suitable for commercial and industrial purposes. You can use it anywhere you need ICT services. What’s more, the same module48 can be redeployed to different locations for a single business or it can be used by a different business altogether. Imagine the possible savings in ICT infrastructure complexity and deployment costs. Fully tested and commissioned with all of your ICT infrastructure in place, module48 can be deployed in as little as 10 weeks. That’s faster than other modular solutions, and there’s no comparison with a traditional data centre. Your plug-and-play module48 would be up and running, providing the service you expect, before a traditional data centre facility could even be designed. module48 comes in two sizes with standard configurations. Both form factors comply with all shipping regulations. A 4th generation data centre, module48’s design seamlessly integrates the eight disciplines of data centre engineering: structure, data cabling, electrical, fire and environmental, mechanical, racking, infrastructure management, and security. Because the eight disciplines are incorporated in its construction, module48 gives you the same robustness and resiliency as any traditional data centre. All data centres are built for protection within some form of base building structure. With module48, the ISO container forms the first level of protection for your critical ICT assets. Fibre and copper cable interconnects the physical layer of the network within a data centre, and provides connectivity to the WAN. module48 comes with structured cabling pre-installed to your requirements, making it easier to manage. The design of electrical power supply within a data centre is the most important component. In module48, all electrical components are integrated and hardened for a seamless solution that’s quick to deploy. module48 comes with a very early warning smoke detection apparatus (VESDA) laser particulate detection system, with gas suppression system throughout. This ensures minimum damage to your infrastructure in the event of fire, and means your systems can be back in operation as soon as possible. Ultimate efficiency can be realised with module48 due to free-air cooling with mechanical heat rejection via a refrigerant system. This takes advantage of lower ambient temperatures to save energy and improve the power usage effectiveness of the system, while ensuring the highest level of service from the cooling system — in any conditions. Integrated racking for network equipment (800 mm wide) and servers (600 mm wide) are standard in module48. The module48 infrastructure management system provides proactive, visual and graphical monitoring and control using a web browser, making it accessible from anywhere. Fully integrated electronic security — including access-controlled entry, and internal and external CCTV cameras — is provided with module 48 and integrated with the infrastructure management system. 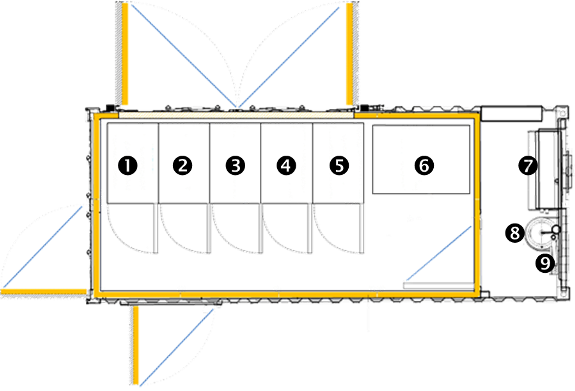 General arrangement of module48–8 showing R3.6 inflow thermal insulation (in yellow). Frame can provide end-to-end implementation services for your module48 deployment. We have a reputation for on-time and on-budget delivery of complex, high-quality data centre projects. We apply the same high-end consulting, engineering and project management principles to module48 solutions. Integrating the best technology and practices from our bricks-and-mortar projects, Frame gets your module48 data centre up and running in the most sustainable way, without the complexity and costs normally associated with ICT infrastructure projects. Read more about Frame’s data centre solutions. Are you ready to change the way you think about data centres? 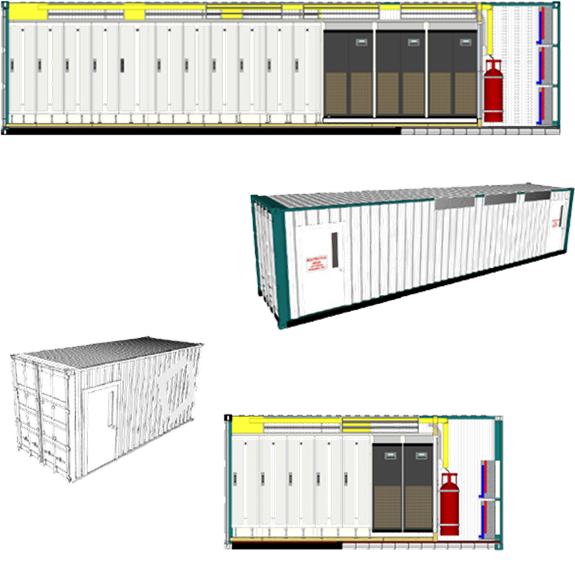 Speak to one of our data centre specialists about the versatility of module48 and how we can customise it to suit your needs.